Four years ago Apple took its 1.1" thick 13.3" consumer MacBook andput it on a serious diet. The new model, designated the MacBook Air, eliminated thebuilt-in optical drive that pre-G3 PowerBooks had in the mid-1990s,went from a polycarbonate case to machined aluminum, ditched thattraditional 2.5" notebook hard drive for a 1.8" iPod hard drive, andreduced thickness to 0.76" and weight to 3.0 lb. without losing thefull-size keyboard or the 13.3" 1280 x 800 display. Since then, thingshave only improved with SSDs replacing hard drives, more efficientprocessors, and even a smaller version with an 11.6"screen. Today we look back atwhat Apple wrought in January 2008 with the computer that created theUltrabook category that the PC world is just starting to embrace. Steve Watkins (The PracticalMac): When the original MacBook Air (MBA) was released, I violatedmy own rule regarding Apple technology purchases: purchase onlyrefurbished units from the Apple Store online. But the MBA was soinnovative and compelling, it virtually demanded I purchase a brand newone from the Apple website. In all fairness, the purchase was for mywife who needed a lightweight, portable Mac. At the time, we shared anoriginal Intel iMac.My wife needed her own Mac, preferably a notebook, but it needed toultra-portable. The MBA fit the bill. Incredibly thin andunprecedentedly lightweight, it was the perfect Mac for her. She iscurrently on her second MBA (fortunately we were able to return to ourtried and true habit of buying refurbished for the next MBA). I will admit, I was initially a bit skeptical when the MBA wasannounced. I felt Apple had shrunk it the wrong direction, making itthinner instead of reducing the footprint. At the time, I would nothave purchased one for myself due to this. However, as time went by andmy wife used her MBA, I became a convert. Once again, it proved one ofSteve Jobs' maxims: People don't really know what they want until youput it in their hands. Brian Gray (Fruitful Editing): When I saw the first images of theoriginal MacBook Air, I didn't get it. It looked fragile and wasseriously lacking in connectivity. I thought Apple had made thecomputer a bit too small this time, and a revision would get a little"fatter" and add some of the functionality back in. I was a skepticalof the machine's future, to say the least. That changed recently when I went to an Apple Store for the firsttime. I had plenty of time, because my wife and I were waiting on aGenius appointment. I looked at the 11.6" Air and the 13.3" Air. Ipicked them up; I marveled at the fine detail of the unibodyconstruction. I had to have one someday. The Air is one of those products we didn't realized we needed untilApple put it in our hands. Charles Moore (several columns): My "whelmedness" withthe original MacBook Air four years ago was lowly under, so to speak.I'm a consummate laptop fan, and to paraphrase an aphorism, there areno bad Apple laptops, but some are better than others, and the skinnylittle power-challenged, port-deprived original Air with its iPod harddrive, downsized processor, and poky graphics support was definitelysecond-tier in my estimation. An Apple netbook by any other name, onlywith a non-swappable battery and absurdly limited connectivity, and acarriage-trade price. Dropping the internal optical drive and havingthe optional freestanding SuperDrive join the queue for the alreadyoversubscribed single USB 2.0 port seemed almost gratuitouslysadistic. The Air seemed to me like an exercise in "because we can"engineering - essentially an engineering parlor-trick cynicallycalculated to pry more money out of the wallets of those who strive tosurf the curl of the bleeding edge. My opinion of the Air mellowed somewhat with subsequent revisions ofthe original form factor model, as it got faster CPU silicon and bettergraphics support that made it a light duty alternative for a seriouscomputer rather than a novelty gimmick. However, not nearly enough tomake me consider buying an Air. However, that all changed in October 2010 with the release of thesecond-generation Air. Ididn't get through reading the press release before I developed a caseof the wanna-have-its. If there was ever a candidate for most-improvedApple notebook model in one generation change, the Revision B Air wouldhave to be it. Overnight, the MacBook Air ascended from off the bottomof my system acquisition short list to share the top slot with the13" MacBookPro, and that's where it has remained ever since. I'm still not100% decided which of those two I will choose for my next workhorselaptop, but over the past couple of months I've been tilting more andmore toward the Air. Of course, if I hold off for a half-year or so and purchase a newunit, the dilemma of choice may become moot. Scuttlebutt has it thatwith the release of Ivy Bridge powered models, Apple will slenderizethe entire MacBook lineup, with all models sharing MacBook Air skinnywedge styling, and the 13" MacBook Pro essentially being merged withand subsumed into the 13" MacBook Air, leaving all new 15" and 17"models to share the "Pro" designation. It's also expected that all models will likely ship sans opticaldrives and be equipped with standard solid state drives. Hopefully, SSDcapacity will be increased somewhat with prices benefiting fromeconomies of scale, but I expect this is the future. My exposure to the world of iPad computing over the past sevenmonths has also caused my thinking to evolve substantially. I hadn'tpreviously imagined I could get along with a 128 GB or going forwardeven a 256 GB SSD, but whether we like it or not, the Cloud is loominglarger. I use Dropbox intensively now for work-in-progress stuff,picked up a free 50 GB Box.net account late last year, and I also have2 TB, 1 TB, and two 500 GB external hard drives, one of the latterbeing a compact Apricorn NetDock unit incorporating a tray-loading DVDburner optical drive as well, which seems tailor-made for use with theMacBook Air. I still don't think tablet computing and touchscreens are the answerfor production computing. Both the hardware and the iOS are tooseriously compromised in the interest of appealing to non-geek usersand likely will remain so. But I have been seduced by the advantages ofhyper-portable, instant on computing, and the MacBook Air seems moreand more like the ideal have your cake and eat it too alternative. I'mnot even ruling out an 11.6-incher. Dan Knight (Mac Musings): Ihave to agree that the original MacBook Air was impressive for its sizebut depressing for its performance. Combine a 1.6 GHz Core 2 Duoprocessor - slower than any Mac of its time - with a pathetically slowiPod hard drive, and you have a proof of concept machine that few aregoing to buy. Then make the SSD version a whopping $2,499, and fewwould choose it over a 15" MacBook Pro with its awesome power and hugestorage space. Getting rid of the slow hard drive was the best thing Apple coulddo, and releasing an even smaller, less expensive version was the icingon the cake. Granted, hardly anyone should buy a Mac with 2 GB ofsystem memory and 64 GB of storage nowadays, but the point is that youcan buy a MacBook Air for just $999. Ad good as the Late 2010 version was, the 2011 update was evenbetter - Core i5 and i7 CPUs gave them plenty of power, and Thunderboltgives them the expansion potential that previous versions, limited toUSB 2.0, simply didn't have. Then throw in an SD Card slot on the 13"MBA, and you've got a cheap way to add storage without carrying a USBdrive. If I were in the market for a Mac notebook, the 13" model with128 GB would probably meet my needs. Kudos to Apple for taking a great concept and improving it from onegeneration to the next until it became practically perfect! Dan Bashur (Apple, Tech, andGaming): With the release of the MacBook Air just 4 years ago andthe first iconic ads that appeared depicting the wafer thin devicefitting into a manila business envelope, no one could fathom how farthe MacBook Air would come since its groundbreaking inception. Asstunning as the thinness of the unit was, it came from humble rootswhich began with little connectivity (just one USB 2.0 port and noFireWire, one analog headphone out, and a micro DVI graphics output)while also being outfitted with the Intel GMA X3100 graphics chipset(which left much to be desired), greatly limiting its multimediacapabilities. 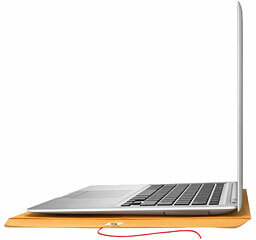 All of that would change with one breakthrough after another, butperhaps the most impressive was the most recent release from mid-2011that includes Core "i" processors, backlit keyboard, and a ThunderboltPort, which provides much improved processing while allowing access tomany connective options that didn't exist before (such as FireWire, USB3.0, and even ExpressCard 34, courtesy of adapters), although it islimited to running OS X 10.7Lion and later. The Late 2010 model that coincidentally includesthe superior GeForce 320M integrated graphics also runs Mac OS X 10.6 Snow Leopard, so youhave to pick and choose what you need the most between the Mid 2011 andLate 2010 models - connectivity or compatibility, respectively.Beginning in late 2010, the 11.6" MacBook Air also was an option, andit is arguably the best replacement to the 12" PowerBook G4, which I proudly own. At the end of the day, the MacBook Air continues to revolutionizehow we operate. It's the middle step between a tablet and a fullfeatured notebook, which PC manufacturers are trying to mimic in the"Ultrabook" category - and I doubt if any manufacture will outdo thesheer ingenuity of the Air. The most recent version of the MacBook Airhas plenty of features and muscle to beat down any cheap netbook thatstands in its way, and with the advent of the aforementioned PCUltrabooks, it obvious why the netbook thing is, how do I put it, so 27seconds ago. One of the memories that has stuck with me when it comes to theMacBook Air was when an Apple Store employee performed a demonstrationwhere he opened up every application installed on the new MacBook Airsimultaneously (roughly a dozen or so applications) to demonstrate howfast the memory shifts between the bus and the SSD. The MacBook Airquickly populated all of the windows for each application and broughteverything up almost immediately, courtesy of the direct lineconnection from the system bus to the memory and SSD, while a 13"MacBook Pro outfitted with the same amount of memory and a standard5400 RPM SATA hard drive could not come close to mustering the strengthto perform the task and essentially crashed. Clearly, the MacBook Air is a great, fuller featured alternative tothe iPad (from a portability perspective) that arguably handlesmultitasking even better than traditional Mac notebooks, but with mostthings, there's a catch. Without the ability to upgrade the memory, I'mstill a bit of a skeptic if it could be a long term replacementcompared to a 13" MacBook Pro, which is also very lightweight andportable and can also gain the ability to multitask much better byreplacing the standard hard drive with a fast 6 Gb/s SSD, while gainingeven more connection options and still technically retains the abilityto run Snow Leopard (all 2011 versions). When a MacBook Air with aRetina touch display (maybe even a 3D display) with the same keyboardand touchpad exists while gaining removable and upgradable memory I mayfinally be sold myself in lieu of an iPad.